Why is Live Video the future of Digital Content Marketing ? 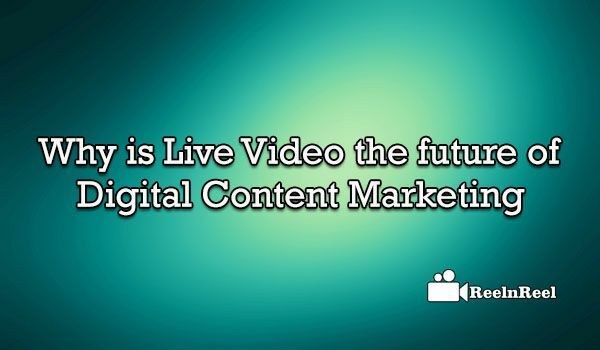 Home » Video Marketing » Why is Live Video the future of Digital Content Marketing ? We all know that how the video has become the most powerful marketing tool in the present digital era. More than 72 percent internet traffic was accounted for video content across the web. With the mobile smart technology, the video consumption has further raised its growth in different ways. Marketers, brands, and individuals are experimenting with the videos to reach and connect with the people across different platforms. The real-time interactions have become the most important today to build powerful connections with the people in real time. The real-time marketing and branding have become the next big thing in video marketing and advertising strategies. The online streaming is the future of content marketing today. Many online live streaming applications and live streaming features already developed today and people are interested in them to get connected in a different way that too in real time. Live video streaming has become the most important part of digital content marketing strategy. Marketers are utilising the periscope, meerkat, and many other popular live streaming applications to reach the people. Brands are promoting the products and services with different live streaming strategies. Many brands are launching their new products and services via live streaming and interacting with the people live about the products. This way of interacting and connecting with the people live can boost the conversion rates of the company which in turn helps the brands and marketers to develop the things as they are. The mobile has the enormous demand to watch live videos, and most of the marketers are developing the business videos that best fits for all devices. If you are at the initial stage of your business and marketing in traditional way, then it’s better to choose the theme of online video marketing. The online video is the everlasting viral concept in the Global market, and this is the only medium through which the marketers can easily reach the targeted customers by describing the product or services. So here you will find the importance of live video in digital content marketing.